Did you watch the Golden Globes? I always enjoy watching celebrities walk down the red carpet. I followed it on Twitter and television. The popular "color" this year was BLACK. Were you shocked? I was. I'm a big fan of black and they looked fabulous in it, but I thought we would see lots more color. Well, there was color on the red carpet, but it seemed to fall flat. My two favorites were Katharine McPhee in va-va-voom Theory, Anne Hathaway in that gorgeous Chanel and Helen Mirren put some of the younger celebrities to shame rocking a gorgeous Badgley Mischka. And ooh la la can we just clone Bradley Cooper and Leonardo DiCaprio. They are just super hot haute hot in my book. What are your thoughts? Did you have any favorites? 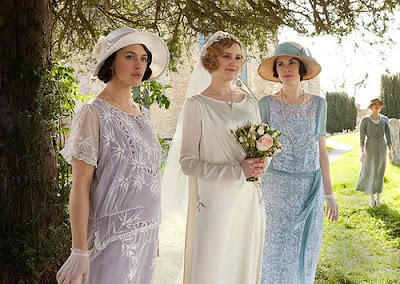 Did you watch Downton Abbey? I refused to miss it tonight. That old geezer left Lady Edith standing at the altar. HaHaHa He ran! So embarrassing. I know it's horrible, but I couldn't stop laughing. Edith has been so mean, jealous and envious of all her sisters. She's a horrible sister! They stay so supportive of her, despite her antics. I am a tad bias because I've been madly obsessed with Leonardo Di'caprio since I was 7... but I must say, he does look sharp! Perhaps the most chic man there that night? Loved the Red Caroet looks this year! My favorite dress was Julianne Hough! Everyone looked pretty hot, there weren't that many BAD dresses... as much as there was black, there was a sea of pale nudes and fishtails too! Clare Danes rocked for looking hot and being a new mum too! I think Helen Mirren really store the show at the Golden Globes, dress-wise. And I think it's awesome to see someone of her age look so fabulous and so natural at the same time. I can only hope I look even half as a good when I'm her age! Great selection my favorite is the Chanel dress ! I always miss the Golden Globes and Academy Awards ceremonies because of European times mismatch but I always love to drool over the red carpet pictures next day! I loved Zooey Deschanel in red and the sober Tom Ford that Julianne Moore wore. Ok I need to watch "Downton Abbey!" Ah, red carpet season. Wonderful! Helen Mirren looks stunning! I also posted my GG post today :) I loved Hayden Panettiere this time round, something new and grown up for her. Also McPhee killed it in that slinky black dress. I think we get Downtown Abbey on the BBC here, just need to research when! I feel ya. There was lots of black. Don't get me wrong black and white are my favorite colors but it seemed too safe. I wanted pizzazz. My favorite was Amy Adams. I missed the Globes so thank you for the recap! I think black is rather boring on the red carpet (other than for men) so that's a bit of a disappointment. Oh I envy you when it comes to Downton Abbey - you still got so much to look forward to! I love the series with all my heart and can't wait to watch the next season. Thank you for sharing the outfit photos - I missed everything, as always, so the more I can see, the better. P.S. Added more images to the Hermes campaign, but must admit, the very first one is still my favourite. Daniel Craig's suit seemed a little too long for him. But I love all those guys. So classy. I dont watch Downtown Abbey:(. Love Anne Hathaway and her outfit. How does she stay so slim?? LOVED Anne Hathaway! The dress, the hair the makeup...everything was perfect. I didn't watch it, but there's so many gowns that look amazing. The men's suits are excellent too! :) Happy Monday Kim! It was super fun watching some of the Globes last night, tons of pretty dresses. I only watched the first episode of Downton so far,but I guess I now know what happens nest haha. Their wedding dresses are GORGEOUS! so, i missed it all. Personally, my favorites were Lady Mary's white/gold dress and Kate Hudson's black/gold dress! I didn't watch the GG so I missed all the dresses. UGH! These ladies look great and I'm happy to see black back too! I also have a soft spot for Bradley Cooper and James Bond so I think they look hot! I skipped over your Downton Abbey part because I haven't seen any of Season 3 yet. I'm waiting for the whole season so I can lounge in bed in my pj's and eat and be totally lazy and watch one episode after another. Should I admit that stuff? I hope you had a great weeekend! I love Rosie Whiteley's look - totally missed that when I was watching. Hahahaha Kim, I totally agree, let's clone Bradley Cooper ... if not the whole guy, at least his eyes! No matter what the stars are wearing, it's always so much fun watching them walk the red carpet, no? I SO wish I'd started watching Downton Abbey from the beginning ... by the time I realized I was missing something, I felt I'd be too far behind. Everyone says it's great! Hi Kim, I thought Tina and Amy were hysterical! I really enjoyed the show last night. Personally, I love Kate Hudson and Kerry Washington. Sounds like you really enjoyed the return of Downton Abbey! I liked a good amount of the Golden Globes dresses last night, including some of these black ensembles. Love your picks, and VERY surprising about all the black! Katharine McPhee looks GORGEOUS and Helen Mirren just rocks it every time! i didn't watch, but i'm loving the black. i saw a few other posts, and i loved kate hudson in her black dress! It's so fun to see all the gorgeous gowns and the men looking so dapper in their suits! I really loved sofia's dress! I always enjoy the discussion about the dresses after the event and there did seem to be a lot of black this year. I thought Helen Mirren looked very elegant and the embellishment made her dress look interesting too. I watched some of the arrivals and DVR'ed the event so I could zip through it. I actually liked the return to black and white since it's so classic and graphic. 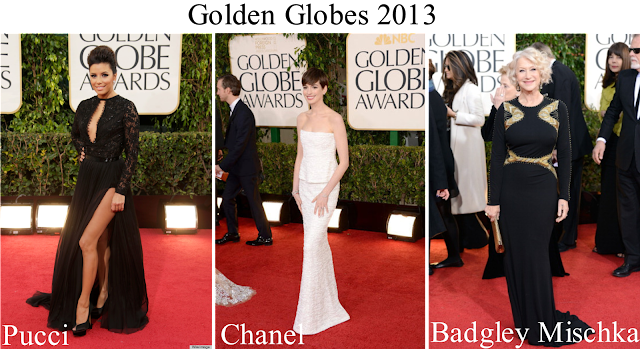 I thought Anne Hathaway looked divine and the color standouts for me were Jessica Chastain and Naomi Watts. aaargh, I so need to get caught up on that show! sounds divine. I glazed out a bit at the awards. Especially after seeing weather man Al Roker trying to ask women about who they're wearing. Er, no. I am loving Bradley Cooper :) !